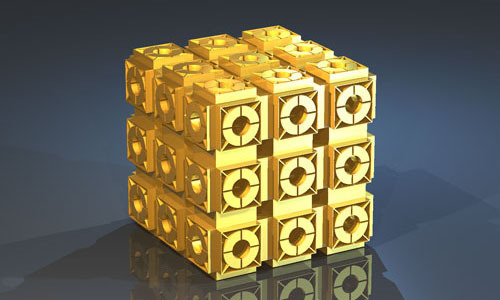 A model of a three-dimensional metamaterial. Ames Laboratory scientists developed a method to evaluate different conductors for use in metamaterial structures. As researchers at Ames Laboratory aim to move innovations from the realm of science fiction closer to reality, they developed a method to evaluate different conductors for use in metamaterial structures that may lead to technologies with unheard of properties. Scientists at the U.S. Department of Energy’s Ames Laboratory have designed a method to evaluate different conductors for use in metamaterial structures, which are engineered to exhibit properties not possible in natural materials. The work was reported this month in Nature Photonics. Cloaking devices that hide planes from RADAR, microscopes that can see inside a single cell, and miniature antennae that measure only a few millimeters all sound like parts of a science fiction movie. But, within the span of the decade since they began their work, Ames Laboratory physicist Costas Soukoulis and his research team have moved these and other innovations from the realm of fiction closer to reality. “Metamaterials have a few fundamentally new properties that may allow for many new applications,” said Soukoulis. For instance, natural materials refract light to the opposite side of the incidence normal, while metamaterials can refract light to the same side (left-handed materials), allowing imaging with a flat lens. Metamaterials are also capable of absorbing all light that hits them, reflecting none of it, creating perfect absorbers. The materials can even slow light. And what makes these properties even more interesting is that they can be adjusted to the needs of particular technologies. Take, for example, the goal of creating super-efficient devices to harvest sunlight in solar energy products. Ideal materials for such a device would absorb 100 percent of the solar spectrum. Other possible applications are “superlenses” that would allow us to use visible light to see molecules, like DNA molecules, in detail and devices that store large amounts of data optically. And many other potential uses exist because, unlike in natural materials, metamaterials can be designed to work at target frequencies, at least in principle, from radio frequencies to visible light. But with such great potential also comes several challenges, some of which Soukoulis’ team have already made significant progress toward meeting. In 2006, the researchers were the first to fabricate a left-handed metamaterial, one with a negative index of refraction, in waves very close to visible light. In 2007, the group designed and fabricated the first left-handed metamaterial for visible light, and they recently fabricated chiral metamaterials that have giant optical activity. Another challenge is reducing energy losses in metamaterials. Energy is lost by conversion to heat in their metallic components. In results reported in Nature Photonics this month, Soukoulis and his team evaluated a variety of conducting materials – including graphene, high-temperature superconductors and transparent conducting oxides. While neither graphene nor superconductors will immediately fix losses in metamaterials, Soukoulis’ work provides a method for evaluating future candidates to replace gold or silver that will help harness the enormous potential of metamaterials. Be the first to comment on "Ames Laboratory Seeks to Make Science Fiction a Reality"